SKBU recruitment 2017 notification has been released on official website www.skbu.ac.in for the recruitment of total 53 (fifty three) jobs out of which 01 (one) vacancy for Junior Assistant, 02 (two) for Laboratory Attendant & Various Vacancies. Job seekers should apply on or before 29th December 2017. Here on this page you will get the details like the Name of vacancies released by SKBU with exact number of posts. Some other criteria like Education details, application fee and way to apply application for SKBU recruitment 2017. Educational Qualification: Passed H. S. or equivalent examination (10+2) and Computer proficiency for S.no-1. Passed class VIII, but below HS or equivalent examination (10+2) for S.no – 2. 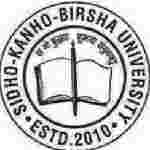 Fee charges: Applicants who wanted to participate for SKBU should pay the below charges through Draft/ NEFT in favour of Sidho-Kanho-Birsha University, payable at Purulia and for NEFT payment system (A/c No:- 1102104000061311, Name:- SKBU STUDENT FEE COLLECTION, Name of Bank:-IDBI, Branch:- Purulia, IFSC :- IBKL0001102). Interested and eligible aspirants should apply in prescribed application form along with all testimonials / documents, complete in all respect send to the Office of the Registrar, Sidho-Kanho-Birsha University, Ranchi Road, Purulia 723104, West Bengal on or before 29.12.2017.